Ultra-waterproof, three-layer pants with just the right amount of stretch. Bootpack. Ski powder. Do backflips. Eat nachos. Do whatever you want in the Magnum Pro Pant. They’ll move with you. 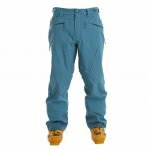 These lightweight, breathable, three-layer stretchy shell pants with a jersey-backed lining have calculated stitch lines to better serve you in all types of movement. Plus, cross-flow venting keeps you cool and five pockets, including a cargo pocket on the thigh, store all the stuff you probably shouldn’t be carrying anyway.